Everything you ever wanted to know about that grey stuff. Everyone knows that potatoes can be eaten with or without the peel as long as they’re clean, but does the same logic apply to salmon? I was raised by a mom who treated fish skin as if it were toxic, skinning fillets before serving and dutifully reminding me to watch out for any grey bits while eating. However, as I started learning to cook, I noticed that many recipes let you leave the skin on. Let’s get to the bottom of this. First off: the benefits. Everyone knows that salmon is full of healthy fats, but much of those are actually stored in the skin. Omega-3’s, known to help prevent heart attacks, are found in the salmon’s fat and get absorbed by the skin during cooking. Plus, the skin will help the meat retain its moisture as it cooks. Many people cook salmon whole and then skin it before serving, but searing the outer layer adds more texture to your dish. If cooked right, fish skin can bring a delightfully crispy dimension to a standard fillet. Or, if you’re like me, you can just eat the skin along with the rest of the fish, no special preparation needed. It’s all a matter of preference. A lot of people spurn salmon skin simply because they dislike the taste, but, unfortunately, there is also a non-subjective reason to avoid it. If salmon swim and feed on other animals in contaminated waters, the toxins will bioaccumulate in the fish’s skin and fat. These pollutants can include PCBs and the notorious (methyl)mercury, which have been linked to health complications in humans, especially pregnant women. However, most contamination concerns arise from farmed salmon. 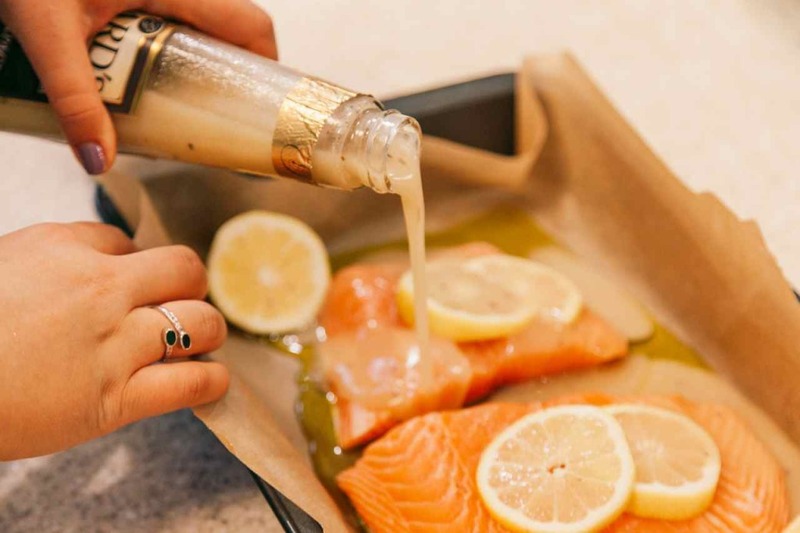 According to this study by Indiana University, farmed salmon tend to have much higher concentrations of contaminants than those caught in the wild. The report goes on to say that the risks of eating farmed Atlantic salmon could outweigh the health benefits and therefore advises against it. Note that the study says that farmed salmon meat is problematic – it doesn’t single out the skin as being particularly dangerous. My interpretation of the findings, therefore, is this: buy wild-caught salmon and eat whatever bits you want. As someone who fervently hates food waste, I take any chance I can to avoid throwing pieces of food away. Now that you know both sides of the story, you might want to spare yourself the risk of ingesting chemical run-off. Or you can have some yummy omega-3’s by making your salmon skin into sushi or bacon. Your call. Why Do You Remove the Skin from Salmon?